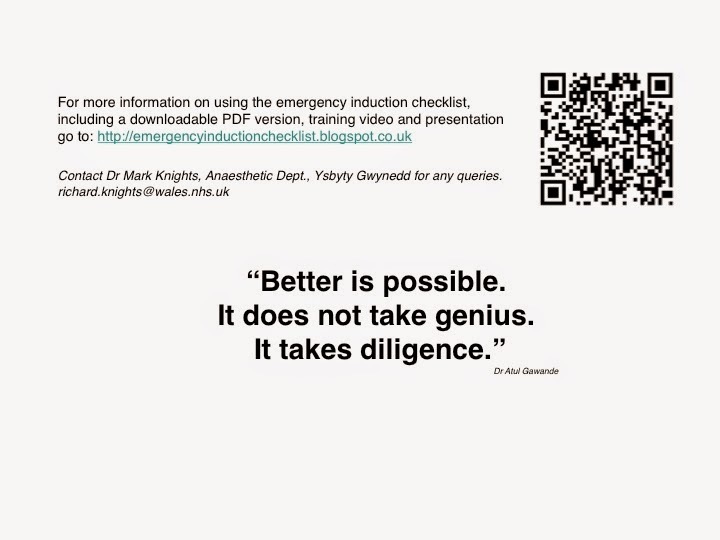 A great argument here from Dr Tim Leeuwenburg who presented at smaccGOLD in March 2014 on the subject "Should Real Airway Experts Use Checklists?". Highly recommended reading. 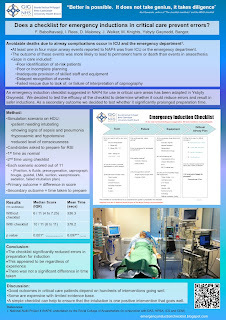 In 2012, in response to the findings of the 4th national audit project of the Royal College of Anaesthetists of Great Britain (NAP4), Ysbyty Gwynedd in Bangor, North Wales developed a checklist to be used by staff prior to all emergency intubations / rapid sequence inductions in the ICU / ITU and emergency department (ER). We have validated and audited the checklist and have it is now a standard practice in Ysbyty Gwynedd. 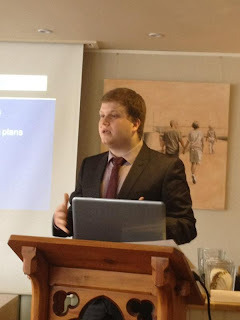 We have developed some training presentations and a training video (on you tube) which we are happy to share freely through this blog. The checklist is adapted from one published in NAP4. The checklist we use is also available on this blog. Please feel free to browse and use these. If your hospital / department are not currently using any form of verbal checklist for emergency intubations - why not? Are you confident that all your emergency intubations are perfect? Do you think there could be room for improvement? To quote Atul Gawande "Better is possible. It doesn't take genius, it takes diligence"
Take our checklist - adopt it for your own hospital / department and start using it. Abstract published in Anaesthesia 2013, 68, 655-661. 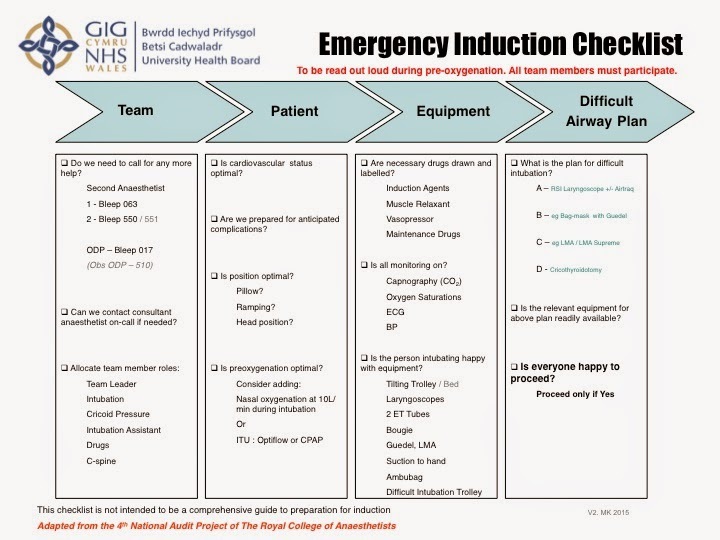 Our emergency induction checklist is now a standard practice for all emergency intubations in the emergency department and HDU / ITU here at Ysbyty Gwynedd in Bangor, North Wales. A recent audit found that most users find that it is very helpful and does not significantly delay the intubations. I am also glad to hear that it the you tube video that we made has been used for mandatory training in the Gold Coast Hospital, Queensland, Australia (where oddly enough I used to work in 2002). Great minds think alike! 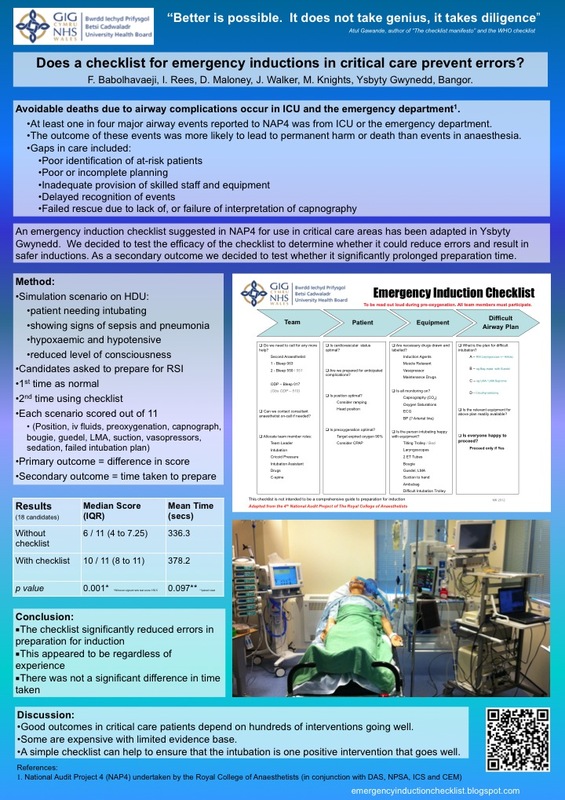 The Emergency Induction Checklist was well received at the annual summer scientific meeting of the Welsh Intensive Care Society in Saundersfoot, Pembrokeshire. Congratulations to Dr Ifan Rees who won 2nd prize in the Ed Major prize competition for his excellent presentation of his study on the effectiveness of the checklist in reducing errors. We should be humble enough to realise that we are human and will not get it perfectly right every time. The checklist is just a tool to assist us. It's free. It's harmless. It works. Quote of the day: We need to get away from the idea that "I don't need to use a checklist because I'm a good doctor" to "I'm a good doctor therefore I will use a checklist"